Another two Zone Conferences have come and gone and we are attempting to get back to normal, whatever normal is here in Benin. 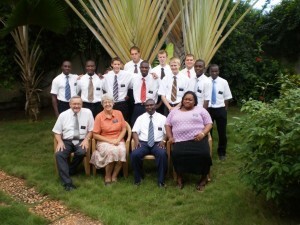 President Ayekoue announced transfers at zone conference so that will mean another quick trip to Lome for Elder Black. We went to Lome on Tuesday, thinking that President and Soeur Ayekoue were coming on Wednesday but at the last minute found out they were coming on Tuesday also, so the pressure was on. Elder Halterman was sick so we had to go to the clinic for tests as we were very concerned about malaria as he had some mosquito bites. Fortunately, all of the tests were negative and it appeared that he had a touch of the flu. The week before I had similar symptoms but it is always best to make sure of a diagnosis here in Africa. After the tests on Tuesday we took him to our home and had him sleep, take fever reducing medication, and eat chicken noodle soup. Sometimes all the elders need is a good dose of Dr. Mom! He was better the next day and fully participated in zone conference but was still a little weak. Unfortunately, Elder Guillory also came down with the same symptoms during the conference so we also had to take him to the clinic but this time we knew a little more what to expect and he required some rest and then was okay. We left Friday morning to come back to Cotonou as Zone conference was scheduled here for Friday afternoon. Elder Ounleu, an area seventy was in Lome for Seminary and Institute graduation and traveled to Cotonou with us so he could attend zone conference here with the missionaries. Zone Conferences are basically the same format in Lome and Cotonou so will talk mostly about the one in Cotonou. We always have a special Zone Conference dinner for the elders and after several months of trying to do both in our apartments, we decided that we would do one at a nice restaurant. This month we went out to eat here in Cotonou which turned out to be quite the experience as we were about two hours late for the actual conference to begin. After leaving Lome and crossing the border, we found ourselves in a torrential rainstorm which slowed us and everyone else down to a snail’s pace. Traffic was stop-and-go for about 10 miles out of Cotonou so we were an hour late at the restaurant. When we finally arrived all the missionaries who were supposed to meet us there were nowhere to be found. After a few calls we found out they were on foot about a mile away trying to wait for the rain to quit. It never did quit and when Elder Black finally retrieved them, they came in “soaked to the bone.” We had pre-ordered the main entrée and all we needed to choose were two side dishes. Sounded simple enough to us but not so, as it took another hour and a half before we saw any food. (West Africa Won Again!) It was really good when it finally came, though, and a nice dinner was enjoyed by all. 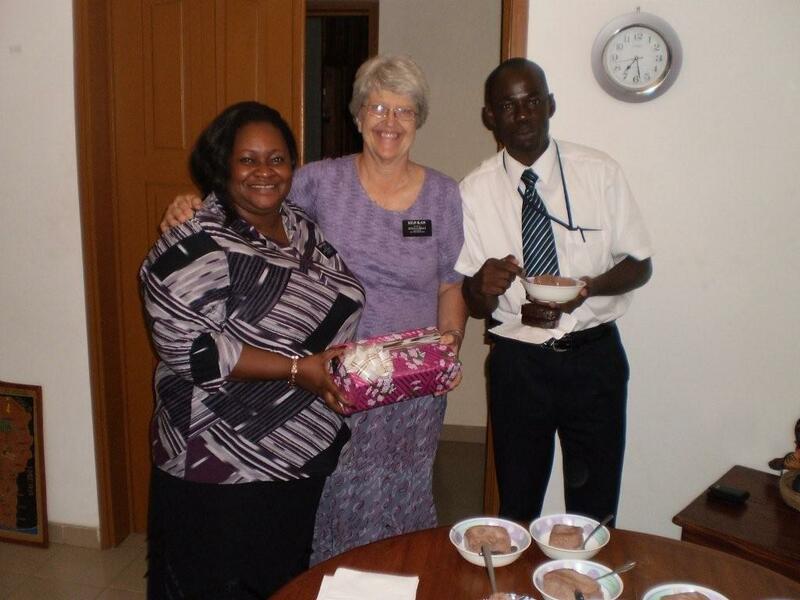 Elder Ounleu was the mission president in the Cote d’Ivoire mission before President Ayekoue took over 1 year ago so most of our African Elders knew him as a mission president also. He is a young man in his 30′s. Speaks English well and gave some excellent training to both the missionaries and the Branch Presidencies while he was here. Before serving as mission president, he served as a stake president in Cote d’Ivoire and President Ayekoue was his counselor so they know each other very well. Saturday afternoon began the Branch Conference for Gbedjromede. The first meeting began at three o’clock and was for the leaders of the branch. The Presidencies of the Relief Society, Young Women and Primary met together for an hour and a half while the Priesthood leaders met together. Soeur Felicite, the Relief Society President gave an excellent talk about staying focused on our responsibilities. Soeur Ayekoue was scheduled to take most of the time but she went to Missebo Marche and didn’t get back in time so I ended up giving an extemporaneous talk using the thoughts from President Monson’s talk to the young women in March about having courage to: “Refrain from judging others, to be chaste and virtuous and stand for truth and righteousness.” Elder Black came and translated and we made it through. In the next meeting all the leaders met together and we were both scheduled to give a talk. I decided to bear my testimony in French, which was a challenge. The members are so forgiving of terrible accents and are thrilled when you try. Elder Black talked about having our lives and hearts turned to the temple as our ultimate goal in life. It was well received by everyone, including President Ayekoue. Sunday was well attended and a good spirit was felt as the branch conference continued. By Sunday afternoon, even President Ayekoue had to admit that he was tired. President and Soeur Ayekoue left on Monday evening and we took the rest of the day off. We did survive. Just one more zone conference to go!